The World Health Organization (WHO: 1980),  has emphasized noise exposure as a hazard for several decades and International Standards exist for estimating the population risk of hearing loss from noise exposure (ISO 1999: 1990). Noise exposure is calculated through a function involving loudness (L Aeq ) and time. For hearing loss purposes, the exposure time is conventionally estimated in terms of years based on the assumption that the population involved is exposed to a reasonably regular, measured or estimated, equivalent continuous, A-weighted sound pressure level. This is because, in practical terms, only a small percentage of those exposed will demonstrate any significant permanent threshold shift for exposures less than 10 years. Clearly in order to make some sort of estimate the number of people exposed to hazardous noise on a nation-wide basis some broad generalizations will have to be made in the first instance. As more data become available a more refined or complex model can be developed. In Australia, as in many jurisdictions, the initial estimates of the number of individuals exposed to hazardous noise came from the number of claims for noise-induced hearing loss (NIHL) or noise injury (NI) lodged annually through the various State, Commonwealth and Territory worker's compensation schemes. A national approach was not seriously attempted until 1991 when the estimate was made that up to 0.5 million people in Australia worked in hazardous noise environments exceeding the now current exposure standard (L Aeq , 8 h) of 85 dB (p. 17, Waugh: 1991). This work was drawn from retrospective compensation claims data and some basic questions from an Australian Bureau of Statistics (ABS) survey (1978: 1988), , on "do you have trouble hearing what people say" style questions. More recently Safe Work Australia (2010),  conducted a nationally representative survey of the Australian workforce using a computer assisted telephone interview (CATI) methodology. The survey was part of the National Hazard Exposure Worker Surveillance project aimed at gathering information to guide future programs in the prevention and reduction of the more prevalent occupational diseases. Noise is a significant occupational disease in Australia and the survey estimated that around 30% of participants were exposed to noise above 85 dB during the course of their work. This translates to around 3.3 million individuals in 2010 terms. Determining the distribution of the workforce across all Australian industries is a reasonable task using the defined procedures facilitated using the Australian - New Zealand Standard Industry Classification code ABS: 2006)  This code takes major industry divisions and systematically breaks them down into smaller, specific areas equivalent to specific workplaces. By assessing noise exposure in these workplaces and then applying data on the number of individuals employed a profile of noise exposure throughout industry can be estimated. The ANZSIC breaks industry into: Division; sub-division; group; and class codes and titles. The ANZSIC can be used in conjunction with figures produced monthly by the ABS on employment, the ABS-Australian Labor Market Statistics  as they match with respect to classifications. The ANZSIC has 19 divisions; 86 sub-divisions; 212 groups; and 505 class codes and titles. Given the availability of assured numbers for people in the workforce, we now need to consider a convenient way to estimate the distribution of noise exposure within each industry. To do this means carrying out noise exposure measurements and assessments at the most basic level of ANZSIC, the class code and title, in actual workplaces. This can be carried out using large scale dosimetry, noise exposure surveys or a crude noise exposure averaging across the workplace. These measures were in fact carried out for this project using dosimetry and task sampling procedures in accordance with the requirements of Australian/New Zealand Standard (AS/NZS 1269.1: 2005),  Occupational noise management, Part 1: Measurement and assessment of noise emission and exposure. As a simple example consider a large, meat processing facility employing around 400 people measured during the project. Using the ANZSIC the division code is "C"; subdivision "11" food product manufacturing; Group "111" meat and meat product manufacturing; and class code and title "1111" "meat processing." The complete code for the location is C1111. In total for the manufacturing division there are 15 subdivisions, 55 groups and 142 class codes and titles. For a comprehensive sample, several of each of the 142 class codes and titles should be visited. However, this may not always be practical or necessary. ABS Australian Labor Market Statistics 6105.0 April 2010 (ABS: 2010),  shows there were 193,900 employed persons in the food product manufacturing industry. The average measured daily noise exposure (L Aeq , h) for workers sampled in this meat processing (n = 16) was 90.1 dB (SD = 4.0). The range of exposures was 85.8 dB to 100.4 dB and the 95% confidence interval (95% CI) was (82.3-97.9 dB). At this particular meat processing facility, there was one main work area due to the nature of the processes. Some work sites may consist of many work areas each with numerous tasks. So the above estimates are to be taken as representative for this workplace. The noise exposure estimation process at this level must ensure that the appropriate ANZSIC class code and titles are being addressed and that samples are representative. The next step in the process is to the group level including all manufacturing up to a C111x prefix. In this group, there are three class code and titles, most average around four to five. Next is the subdivision of food product manufacturing commencing with prefix C11xx of which there are 15 in this particular case. The minimum number of subdivisions is two in the division of administration and support services. For this part of the exercise 45 organizations in the Manufacturing industry were visited including 246 separate workplaces where 672 activities were measured. These industries included: Food; bakery; beverage and tobacco; textile, leather, clothing and footwear; wood product; non-metallic mineral products; primary metal and metal products; and furniture and other manufacturing (9 out of 15 Sub-divisions). The mean exposure for all of these industries was estimated to be 83.0 dB (SD = 7.2). If we assume our sampling was sufficient and the industries measured are representative of the food manufacturing industry as a whole, and that the noise exposure is distributed normally over those in the industry we can estimate, through z-scores that approximately 161.6k individuals out of a total of 193.9k are exposed to levels above the recommended standard of 85 dB. The more workplaces and the more individuals we can assess the better the accuracy (trueness and precision). This is a limitation of the current study. The method can now be extend the process to include all of industry by gradually building from class code and title to group, sub-division, concluding with an estimate for all Divisions and all industry. This is carried out with [Table 1] providing a first approximation of 2.2 m (20%) out of an estimated 10.90 m people in the workforce regularly exposed to noise levels above the recommended exposure standard of 85 dB with a further 1.0 m (9.4%) exposed to greater than 90 dB. Around 4.2 million (38.6%) of the workforce is exposed to levels above 80 dB. 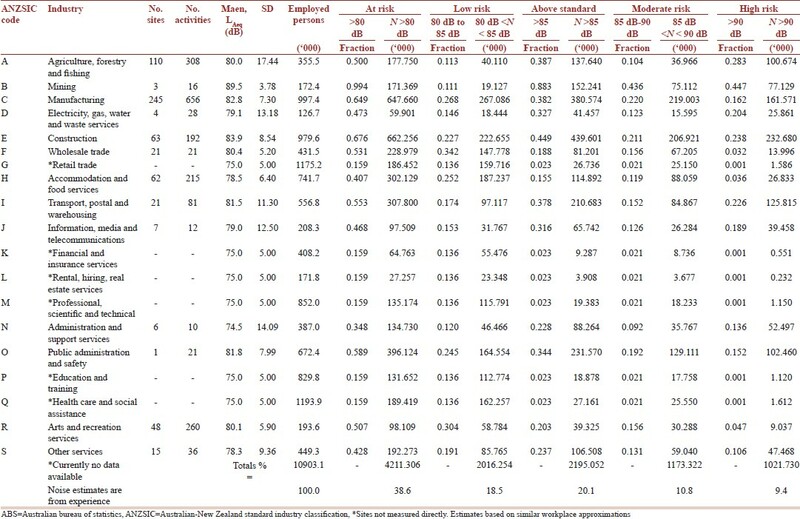 The analysis of exposure as presented in [Table 1] shows that based on 2010 figures for Employed Persons (ABS: 2010),  in Australia there were 10.9 m people in the workforce, of whom 4.2 m (38%) were regularly exposed to levels above 80 dB and 2.2 m (20%) were regularly exposed to noise levels at or above the exposure standard of 85 dB. Of those above the exposure standard around 1.0 m (9.4%) are at or above 90 dB. At this point, it should be noted that due to the non-linear characteristics of using decibels as a measure, an exposure of 80 dB represents approximately one-third (32%) of the exposure standard of 85 dB (100%) while an exposure of 90 dB represents 3.2 times, or 320%, of the recommended exposure standard. The Australian Safety and Compensation Council (ASCC: 2006),  reported a Swedish study carried out by the National Institute for Working Life (2002 [undiscoverable]),  that estimated "more than 800.000 out of the 3.9 m employees in Sweden are exposed to noise so loud that they can't communicate in a normal voice during at least ¼ of their working hours" (p 23). This figure represents about 20.5% of the Swedish workforce. In the UK estimates are that around 2 m people are regularly exposed to loud noise at work, about 1.1 m to levels above 85 dB (EU: 2005). With the UK workforce at 25.6 m (UK National Statistics: 2001),  this is an exposure rate of around 4.3%. In the same report NIOSH (1998),  attempted a fractional allocation of the distribution of the number workers exposed to noise in seven major economic sectors (professional; administrative; clerical; sales; services; agricultural; and production) and nine occupational categories (agriculture; mining; manufacturing; electricity; construction; trade; transportation; finance; and services). The apportion of noise exposure to the seven occupational categories was further developed across an expanded nine economic subsectors by the WHO (2004),  to produce a "proportion of workers in each occupational category and economic subsector exposed to noise levels > 85 dB (A)" (p 12) using the above NIOSH work "either by extrapolation from the most relevant subsector of the survey of production workers. Or by expert judgment" (p 13). This methodology was subsequently extended to estimate the importance of noise as a risk factor for hearing loss on a global scale (Nelson et al. 2005). These estimates ranged from 7% to 21% (averaging 16%) depending on world region and gender. "Between 28% and 32% of the Australian workforce are likely to work in an environment where they are exposed to non-trivial (≥85 dB [A]) loud noise generated during the course of their work." (p 1). This estimate is greater than the current estimate of 20% determined in this work. With this in mind, the current estimate could be considered as a starting point for future estimates. The most obvious implication of these figures is the potential for NI to the ear and subsequent hearing loss in the workforce. Combined AS/NZS 1269.4 Occupational noise management, Part 4: Audiometric assessment (AS/NZS 1269.4:2005),  uses the methodology of ISO 1999: 1990  Acoustics-Determination of occupational noise exposure and estimation of noise-induced hearing impairment and National Acoustic Laboratories (NAL) Report 118, improved procedure for determining percentage loss of hearing (PLH) (NAL: 1988),  to calculate the expected PLH of a noise exposed group of individuals for a given time. If we consider an unscreened male population exposed to an equivalent continuous, A-weighted exposure level (L Aeq,8h ) of 80 dB then at the end of 30 years, for example, 61% of those exposed could expect to have a mean PLH of 6%. With an exposure of 85 dB, this rises to 70% of the exposed population expecting a mean PLH of 7% and at 90 dB, expect 82% with a mean PLH of 8%. For females the respective values are: At 80 dB, 24% with a mean PLH of 4%; at 85 dB, 34% with a mean PLH of 4%; and at 90 dB, 53% with a mean PLH of 5%. A possibly wider and more significant problem resulting from long term noise exposure is the difficulty experienced with reduced temporal and speech processing skills (Brattico et al. : 2005; Kujawa and Lieberman: 2006; Kujala and Brattico: 2009; Feng et al. 2010; Kumar et al. 2012). ,,,, Research in this area indicates, by direct comparison of those with equivalent hearing thresholds, that noise exposed individuals show significantly poorer speech and temporal processing skills compared to their non-noise exposed counterparts (Kumar et al. 2012). Further, testing has also revealed altered "hemispherical, lateralization of the speech sound discrimination, diminished … processing speed of small sound contrasts" and impaired "non-speech versus speech neural discrimination" in the noise exposed cohort (p 201, Brattico et al. : 2005). Longer term effects may also include "long-term effects on central auditory processing, having a persistent impairing effect on cortical speech discrimination and attention control" (p 143, Kujula and Brattico: 2009). These findings implies there may be a much wider individual and societal impact of noise exposure than that resulting from the consideration of "measurable" hearing loss alone. The limitation of this methodology is that there may be an inherent over-estimation of the number of people in the respective industries who are not exposed to hazardous noise. Owing to the nature of workplace noise assessment, noise measurements are taken in noisy areas and of noisy tasks, but few if any are recorded of the quieter areas. While supervisors may frequently venture high noise areas, office workers, middle, and senior management would only rarely be in such a position. This combination may lead to an over-estimation of the exposed population. Consequently, while the exposure measurements and calculations themselves may be satisfactory there is an underlying uncertainty as to how these measures are representative of the particular industry division, subdivision, etc., as a whole or even on average. Over time as more measurements are carried out the more the uncertainty can be reduced. Given the magnitude of the problem this will be a long, slow process. An alternate methodology could have be used by way of the Australian Standard Classification of Occupations (Australian Standard Classification of Occupations: 1997),  in which occupational groups are characterized. However, this approach does not seem as promising as that using the ANZSIC as the numbers of individuals in occupations is more difficult to classify at any one time. Given the consideration of these limitations their influence would indicate a trend toward over-estimation the incidence of regular noise exposure while it is an under-estimate when compared to the survey by Safe Work Australia. Given the above discussion, the estimates for the Australian workforce of 20% of workers exposed to levels equal to or greater than 80 dB and 9.4% exposed to equal to or greater than 90 dB then the proposed model is of the appropriate order of magnitude and with more refinement, capable of greater accuracy. Thanks to Tim Driscoll from the School of Public Health at the University of Sydney for advice on the global burden of disease and to Mark Seeto, NAL, for patient advice on statistical methodology. 1. Lim SS, Vos T, Flaxman AD, Danaei G, Shibuya K, Adair-Rohani H, et al. A comparative risk assessment of burden of disease and injury attributable to 67 risk factors and risk factor clusters in 21 regions, 1990-2010: A systematic analysis for the global burden of disease study 2010. Lancet 2012;380:2224-60. 2. WHO. Environmental Health Criteria 12 NOISE. Geneva: World Health Organisation; 1980. 3. ISO 1999. Acoustics- Determination of occupational noise exposure and estimation of noise-induced hearing impairment. Geneva: International Organisation for Standardisation; 1990. 4. Waugh R. Occupational noise exposure, hearing impairment, and rehabilitation - An overview of the present position in Australia. In: Occupational Noise-induced Hearing Loss: Prevention and Rehabilitation. Armidale, NSW. National Occupational Health and Safety Commission, Sydney; and The University of New England; 1991. p. 17-38. 5. Australian Bureau of Statistics. Hearing and the Use of Hearing Aids (Persons Aged 15 Years or More) cat 4336.0. Canberra; 1978. 6. Australian Bureau of Statistics. Disability and Handicap Australia, 1988, cat 3302.0. Canberra; 1978. 7. Waugh R. A National strategy for the prevention of noise-induced hearing loss, a submission prepared for the better health commission hearings in Sydney, July 17-19, 1985, NAL Report No 113. Sydney; April 1986. 8. Safe Work Australia. National Hazard Exposure Worker Surveillance: Noise Exposure and the Provision of Noise Control Measures in Australian Workplaces. Canberra: Safe Work Australia; 2010. 9. ABS (2006). ANZSIC, Australian New Zealand Standard Industry Classification. Canberra: Australian Bureau of Statistics, ref 1292.0; 2006. 10. ABS. Australian Labour Market Statistics- 6105.0 April 2010. Canberra: Australian Bureau of Statistics; 2010. 11. Australian/New Zealand Standard. Occupational Noise Management Part 1: Measurement and Assessment of Noise Immission and Exposure, Standards. Sydney, Australia; 2005. 12. NOHSC. Occupational Noise, National Standard for Occupational Noise [NOHSC: 1007 (2000)] and National Code of Practice for Noise Management and Protection of Hearing at Work [NOHSC: 2009 (2000)]. 2 nd ed. Canberra, Australia: National Occupational Health and Safety Commission; 2000. 13. Williams W. Barriers to Occupational Noise Management: The Reduction of Noise Exposure in the Workplace. Saarbrücken, Germany: Lambert Academic Publishing; 2011. 15. NOHSC. Occupational Disease Profiles, NOHSC Paper Number: 1/8, National Prevention of Occupational Noise Induced Hearing Loss: Magnitude of the Problem, Current Activities, Effective Approaches and Opportunities for Improvement. Canberra: National Occupational Health and Safety Commission; 2004. 16. ASCC. Work-Related Noise Induced Hearing Loss in Australia. Canberra: Australian Safety and Compensation Council; 2006. 17. National Institute for Working Life, 2002, Programme for Technical Risk Factors: Noise. Available from: http://umetech.niwl.se/English/Action.Lasso?-Database=UITStaff.fp3 and -Layout=Normaland-Response=Noise.htmland-Op=cnandTeam=Noiseand-SortField=GrpChBuller and -SortOrder=descending and-SortField=Titel and-SortOrder=custom and-SortField=Enamnforst and-Search [Last accessed 2012]. 18. EU. Noise at Work. Bilbao, Spain: European Agency for Safety and Health at Work; 2005. 19. UK National Statistics, 2001. Available from: http://www.statistics.gov.uk/census2001/profiles/uk.asp [Last accesses November 2012]. 20. Centers for Disease Control (CDC). Leading work-related diseases and injuries: United States. MMWR Morbidity and Mortal Weekly Rep 1986;35:185-8. Centre for Disease Control. Atlanta, GA: US Department of Health and Human Services; 1986. 21. NIOSH. Criteria for a Recommended Standard- Occupational Noise Exposure- Revised Criteria 1998. Cincinnati, Ohio: National Institute for Occupational Safety and Health, US Dept of Health and Human Services; 1998. 22. EPA. Noise in America: The extent of the noise problem. Washington, DC; US Environmental Protection Agency, Report No 550/9-81-101; 1981. 23. WHO, Concha-Barrentos M, Campbell-Lendrum D, Steenland K. Occupational Noise: Assessing the Burden of Disease from Work-Related Hearing Impairment at National and Local Levels, Environmental Burden of Disease Series No 9. Geneva: World Health Organization, Protection of the Human Environment; 2004. 24. Nelson DI, Nelson RY, Concha-Barrientos M, Fingerhut M. The global burden of occupational noise-induced hearing loss. Am J Ind Med 2005;48:446-58. 26. US Department of Labor, 2004. Household data annual average, 1. Employment status of the civilian noninstutional population, 1940. Available from: ftp://ftp.bls.gov/pub/special.requests/lf/aa2003/pdf/cpsaat1.pdf. 27. WHO. Prevention of Noise-Induced Hearing Loss, Report of an Informal Consultation Held at the World Health Organization, Geneva, 28-30 October. Geneva; 1997. 28. Australian/New Zealand Standard. Occupational Noise Management, Part 4: Auditory Assessment, Standards. Sydney: Australia; 2005. 29. NAL. Improved Procedure for Determining Percentage Loss of Hearing, NAL Report No 118, January, 1988, National Acoustic Laboratories, Chatswood, Australia; 1988. 30. Brattico E, Kujala T, Tervaniemi M, Alku P, Ambrosi L, Monitillo V. Long-term exposure to occupational noise alters the cortical organization of sound processing. Clin Neurophysiol 2005;116:190-203. 31. Kujawa SG, Liberman MC. Acceleration of age-related hearing loss by early noise exposure: Evidence of a misspent youth. J Neurosci 2006;26:2115-23. 32. Kujala T, Brattico E. Detrimental noise effects on brain's speech functions. Biol Psychol 2009;81:135-43. 33. Feng Y, Yin S, Kiefte M, Wang J. Temporal resolution in regions of normal hearing and speech perception in noise for adults with sloping high-frequency hearing loss. Ear Hear 2010;31:115-25. 34. Kumar UA, Ameenudin S, Sangamanatha AV. Temporal and speech processing skills in normal hearing individuals exposed to occupational noise. Noise Health 2012;14:100-5. 35. Williams W. The estimation of noise exposure when using hearing protectors. J Health Safety Environ 2012;28:101-5. 36. ABS (1997). ASCO Australian Standard Classification of Occupations. Canberra: Australian Bureau of Statistics, reference 122.0; 1997.